Turn your backyard into a wildlife haven by adding these Songbird Essentials Peanut Wreaths or Nesting Material Holders to it. This package contains 3 of these hardy, steel holders, which can accommodate peanuts in the shell or nesting material equally easily. 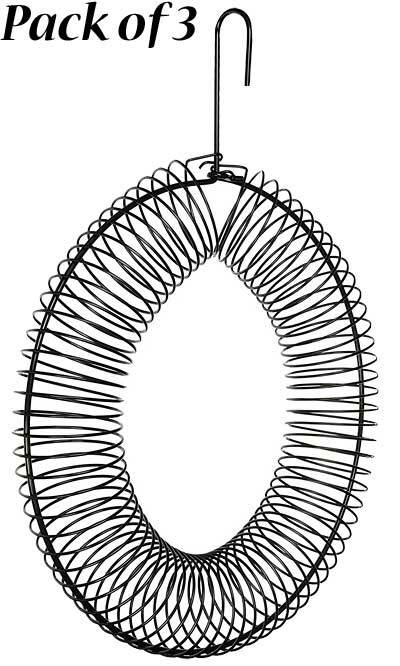 A 2.5" diameter, metal spiral surrounds each 12" diameter ring, creating a lasting frame capable of holding 0.85 quarts of peanuts in the shell. This allows squirrels, jays, or other wildlife to dine, for a busy backyard sanctuary. The spiral may also be filled with nesting material and other natural fibers, which birds can pull through the open design for lining their nest. The black finish on each piece brings a classic look to the area, and a top hanger makes placement of each simple. Remove these units and fully disassemble them for cleaning or refilling. Help birds create cozy nests and squirrels remain well fed by adding these Peanut Wreaths or Nesting Material Holders to your yard. Note: This case pack contains 3 of the Songbird Essentials Peanut Wreaths or Nesting Material Holders.